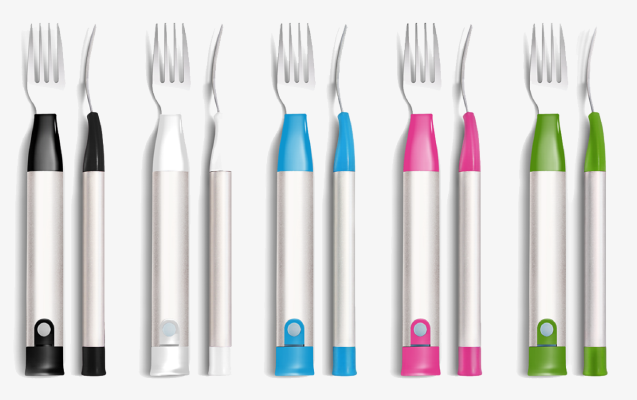 This Augmented Fork Can Make You Eat Slower « Adafruit Industries – Makers, hackers, artists, designers and engineers! Slow Control has released a vibrating fork called the 10s. 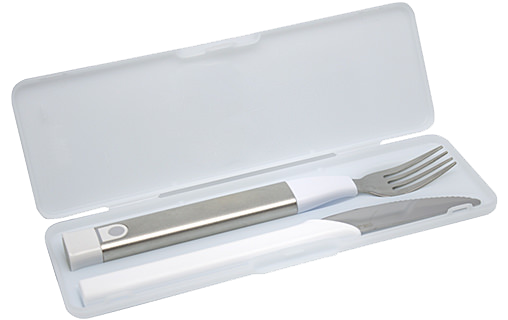 The fork vibrates and flashes when you break the one bite per 10 second speed limit. The company Slow Control suggests that eating slower can result in eating less and subsequently losing weight, but there is a problem. The journal Appetite did their own study and found that people still ate the same amount and did not feel full. The participants assigned the 10s fork did however eat slower. My favorite FAQ entry is “Can I keep on eating with my hands?”. A slower eating rate, however, did not lead to a significant reduction in the amount of food consumed or level of satiation. These findings indicate that real-time vibrotactile feedback delivered through an augmented fork is capable of reducing eating rate, but there is no evidence from this study that this reduction in eating rate is translated into an increase in satiation or reduction in food consumption. Overall, this study shows that real-time vibrotactile feedback may be a viable tool in interventions that aim to reduce eating rate. The long-term effectiveness of this form of feedback on satiation and food consumption, however, awaits further investigation.